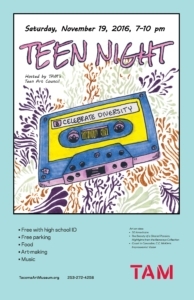 Teens take over TAM during this night filled with art-making, music, performances, and more! Planned by TAM’s Teen Art Council and inspired by 30 Americans, this is one night at the museum you won’t want to miss. Parking in the TAM lot is free for this special event! 10 pm – Say goodbye, until next time! This program is supported by KeyBank and Russell Investments.